New member to the forum in Bali. just joined last week to ask some advice about my AN1x and found the information i needed. I have a little setup in my studio apt here comprising a few keyboards and synth modules and a computer. Used to do a lot of gigging on the Asian circuit playing keys but those days are behind me and i spend my time playing, composing, sound-designing (twiddling knobs) here mostly. i've attached some pics of my setup which is plenty to keep me occupied. My computer holds a few softsynths but not many, the spectrasonics collection and eastwest composer cloud and that's it. But together with my hardware synths i think it can cover whatever is required. My keyboards are a Roland A-70 controller, X-key 37, Minilog, AN1x and a Casio PX-5s. The rack you can probably make out from the photo. I've bought and sold a lot of gear over the years...started in the 80s with analog synths, 4-track tape decks etc...at various stages have owned a Hammond B3, a Rhodes Mk1 suitcase and an Otari 8 track reel to reel tape recorder among other things. Do i regret having sold anything over the years? Probably not, probably do regret not ever having bought some synths though, eg like the CS80, DX1 (haha). But at the end of the day i now take a more practical approach to music-making so i've kept what space and finances have allowed and continue to try and use whatever gear i have to the fullest potential. My first yamaha synth was a combo organ, i think one of the YC series, in the 80s i owned a DX7 and a DX11 and now i still have the AN1x and the TG77. Fantastic intro post and thanks for sharing pics of your setup. Looks great! 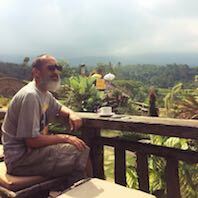 What's the music scene and dealer situation like in Bali? the music scene here is definitely vibrant! lots of great musicians here, balinese, other indonesian and foreigners, plenty to take in whatever your taste. as for music dealers - better in jakarta, you can find a lot more retail outlets and distributors, but still everything there can be shipped here very quickly, and there are a few good music shops here too. a good place to visit for music lovers! Looks like the TG77 has had the obligatory "cool blue" upgrade? Thank you Derek, good to hear the AN1x and TG77 complement each other. It's important that my synths sound good against each other. The TG is the new one in my setup even though i bought it 15 years ago, it went straight into storage when i started travelling and it has only just come out of storage a few months ago and yes i replaced the barely readable screen with the new 'cool blue' upgrade. huge improvement there! I had a good idea what to expect with the TG77 soundwise and in the last couple of months of starting to explore it has even exceeded my expectations...really looking forward to using it in arrangements and recordings with the rest of my gear. Sound (how i percieve it, or like it) is why i kept my XV-5080 and sold the Integra7. The Integra had all 12 SRX expansions plus tons of other great features but the sound of the XV-5080, when i use the wave samples combined with the filters and envelopes, is really something to my ears, and the Integra, even though it did have many great sounds straight out of the box, just didn't inspire me to create sounds on it. I'm hoping my current collection will complement each other all around - each one uses a different synthesis method as well - FM, analog, virtual analog and S+S. Anyway, better stop here, btw, the SY99 looks like a very attractive proposition...is it essentially identical to the 77 in terms of sound? But I had noticed that there were quite a few EX5 owners on EX5Tech who had kept their SYs. So I took the plunge and found an amazing device in the SY. In fact I realsied that when in 1998 I finally got the DX7 (a DX7II) that I had always promised myself to get into music, that I would have been better off to have gone for an SY. The SY is of the most analog sounding digital synths I have ever come across, especially for a late 80s/early 90s digital workstation. I am so glad that I listened to Clyde. I had the SY77 until 2013 when I managed to get an SY99 at a bargain price, but, to answer you question, I needed to keep an SY77 or replace it with a TG77 (I only have room for four keyboards) because their sound character is actually quite different despite being the same AWM2 and AFM architecture. One difference is that the SY99 has an improved Wave ROM which provided new samples and double the Wave ROM memory (still minuscule by today's standards) so slightly better samples. The key difference, however, is that they have different effects units. The SY77 effects were reknown for have a dulling/grungy sound quality, but that is part of the sound character. Some classic SY77 sounds ("Echohunters", itself an emulation of a classic Wavestation patch is a good example) just sound wrong on the SY99. I was lucky that I got my SY99 for £250. Local collection only in Anglesey Wales, but a nice day trip for me, and my TG77 for £80, as it was sold for "spares or repair" due to malfunctioning display. I've had to do the display upgrade on all of my SYs and the floppy drive belt repair on both the SY77 and SY99. Since then I have acquired extra FM in a Korg Kornos (patchable FM again) and a Yahama Montage. I am also a huge Omnisphere fan as well. It is an amazing synth. I've expanded it with quite a few third party libraries as well. Eric Persing (ex Korg and Roland programmer) and his team have done an amazing job. If you ever want to look at some other soft synths, I can highly recommend UH_E DIVA and ZEBRA. They both sound amazing and very analog. I'm also a huge fan of the XILS-LABS Poly Kobol (rare French synth) and PloyMoog emulation, along with GEForce MTRON Pro for Mellotron sounds. That's plenty of sound making options to keep me busy! This time of year, I start getting the end of summer blues, as the nights start drawing in, but the plus side is more studio time! Strangely enough i've never owned a large workstation type keyboard, though i've been tempted many a time. i've used a Roland A-80 or other controller, connected to racks, also used a Nord Electro 3 a lot, and for sequencing purposes a Roland MC500, then 50 and then 80. But an all-in-one keyboard makes a lot of sense, especially for gigging/travelling a lot. 10 years ago i had a 6 month gig in Seoul and they have the biggest music arcade i've ever seen there. The Nagwon Music Centre, huge building about 3 -4 floors high and all music shops! There were several hundred shops in there selling everything from keyboards to guitars to drums etc etc. Needless to say i was there several times a month spending an entire afternoon just playing different keyboards. 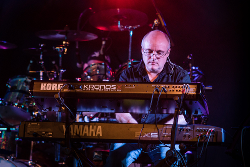 I used to love playing the kurzweil and korg workstations especially. I bought my AN1x there (brand new, the shop had a whole batch of them which they had kept unsold until then) and also on another trip i bought a Novation Nova ll which i used heavily for about 5 years before selling it to a young balinese musician. Nowadays i keep my eye out for a supernova at the right price. One synth that really tempted me in Nagwon was a fully working Prophet VS but was a little beyond my needs and price range at the time. Thanks. Like you I have made some very careful synth acquisitions over the years, and they all complement each other. I have the Wavestation in Virtual form and also the Kronos H-1 one engine has wave sequencing build in. I have the Prophet VS in virtual form as well. It's the way I'm going now. Modelling (and the computing resources required for it) is now pretty much there. Sure it doesn't have the cachet the same as owning the actual vintage gear, but neither do you have the maintenance nightmare.